Cancer treatment is challenging. Ovarian cancer treatment is particularly so, because most cases are detected in locally-advanced stages, due to the absence of symptoms in the earlier stages. Even if present, symptoms are mistaken for non-serious conditions, like digestive problems. As a result, the disease goes undetected until it progresses further. 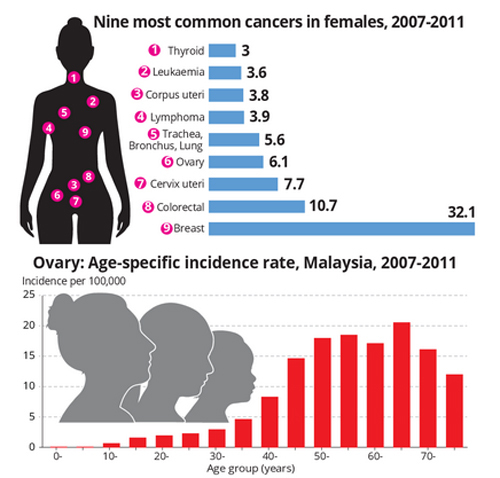 In Malaysia, ovarian cancer is the fourth commonest cancer in women with an aged-standardised incidence rate (ASR) of 5.9 per 100,000 population. It is more common among the Chinese, compared to the Malay and Indian populations. Peak incidence is between the ages of 60 and 65, with more than 50% presenting with advanced disease (Stage 3 and 4), according to the Malaysian Cancer Registry. A locally-advanced ovarian cancer (stage III cancer) refers to cancer that has spread within the abdominal cavity and its lymph nodes, and along its lining (called the peritoneum) that connects organs to each other, or to abdominal and pelvic walls. Surgery is the main treatment for locally-advanced ovarian cancer. Surgical management is essential to ovarian cancer diagnosis, staging and treatment. The ultimate aim is to remove all large tumours within the pelvis and to ensure that no other organs are affected. The extent of tumour removal profoundly influences prognosis in ovarian cancer. In some patients, surgeons may also recommend chemotherapy prior to surgery to shrink tumours and improve the chances of complete tumour removal. After surgery, patients might also undergo chemotherapy, with the aim of clearing the remaining tumour cells left behind after surgery. Chemotherapy remains the principal form of treatment before and after surgery for ovarian cancer, with the exception of good-prognosis early-stage disease (i.e. stage Ia and Ib, grade 1), in which standard care involves tumour removal surgery, followed by observation. During the last 40 years, many clinical trials have been conducted to establish a “gold standard” of therapy and to validate the optimal timing and mode of chemotherapy delivery. Notably, the most significant initial advance in chemotherapy management was the introduction of carboplatin and paclitaxel to the treatment options. Despite initial response to chemotherapy, locally-advanced ovarian cancer tends to recur over time in around 75% of patients. Although changes to both chemotherapy schedules and routes of administration are associated with improved survival, it appears that a therapeutic ceiling with these drugs has been reached. In terms of treatment for ovarian cancer, there has been no significant breakthrough for overall survival in the last 20 years. Within this time, targeted therapy has undoubtedly revolutionised the therapeutic landscape for ovarian cancer with different mechanism of actions, i.e. anti-angiogenesis inhibition, poly(adenosine diphosphate [ADP]-ribose) polymerases (PARPs) inhibition, targeting cancer-related inflammation, folate antagonist, insulin-signaling inhibition etc. In relation to these targeted therapies, patients may be prescribed an anti-angiogenesis inhibitor, i.e. an anti-vascular endothelial growth factor (VEGF) agent, together with chemotherapy after surgery. The combination of an anti-VEGF agent and chemotherapy is also used as the main treatment for metastatic ovarian cancer (stage IV cancer). Anti-VEGF agents disrupt existing blood vessels that supply tumour cells and that enable tumour growth. They also stop the growth of new blood vessels. Researchers found that patients were more likely to live longer without progression of their cancer if they received an anti-VEGF agent plus chemotherapy after surgery, rather than chemotherapy only. The combination of anti-VEGF and chemotherapy is prescribed for up to six cycles, after which patients receive anti-VEGF alone for 15 months or until the cancer recurs. There are factors that determine how doctors prescribe treatment for patients. These include the patient’s age and health status when first diagnosed. Doctors tend to be more careful when treating older patients and patients with other medical conditions besides ovarian cancer. The combination of anti-VEGF and chemotherapy, followed by anti-VEGF alone was tested and found to be effective and relatively safe in these patients. Targeted therapy has changed the treatment of advanced ovarian cancer. Patients can expect better results with anti-VEGF agents and various other agents compared with previous decades when treatment choices were limited. Future medical innovations will further improve the chances that patients with advanced ovarian cancer will live longer. In addition to this, recent data has shown promising results on PARPs inhibition drugs in maintenance treatment for recurrent ovarian cancer in BRCA-mutated patients. 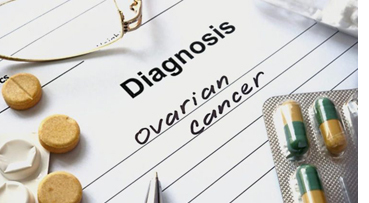 Ovarian cancer management remains a challenge for clinicians. Even though surgery and chemotherapy having been the mainstay of treatment for the last 15 years, there has been only marginal improvement in overall five-year survival. Although changes to the scheduling and administration of chemotherapy have improved outcomes to a certain degree, there have been no significant advancements, resulting in a number of trials investigating the efficacy of targeted therapies alongside standard treatment regimes. With recent advances in targeted therapies with anti-angiogenic agents, PARPs inhibitors and epidermal growth factor receptor (EGFR)/human EGFR family targeting, in addition to folate receptor antagonists and insulin growth factor receptor inhibitors showing promising results, it is certainly possible that significant prolongation of survival could be achieved.